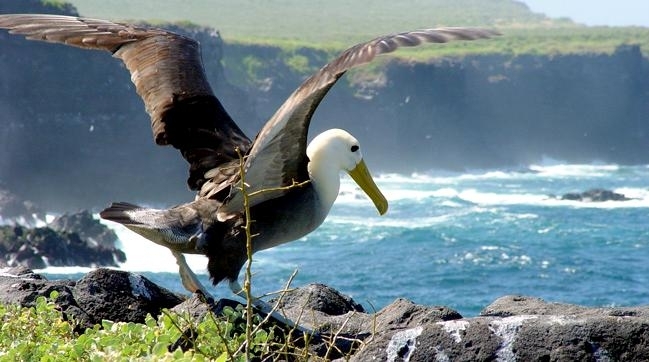 The Waved Albatross is the only albatross that lives in the tropics. 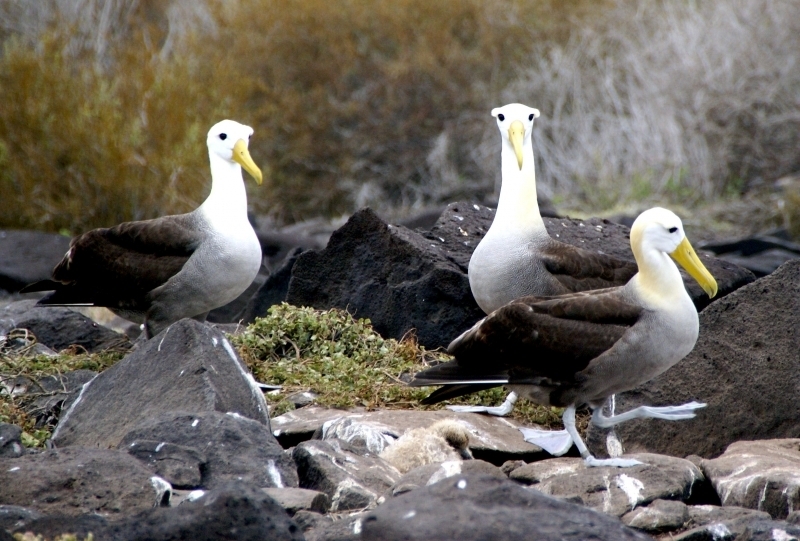 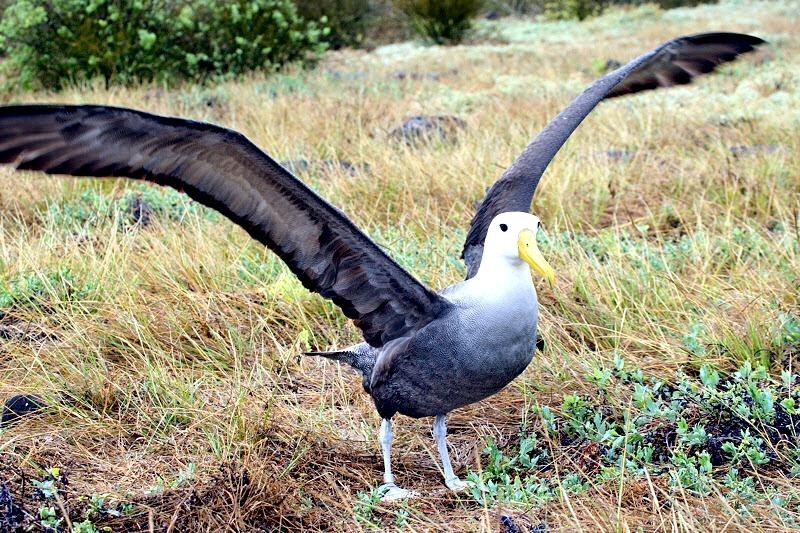 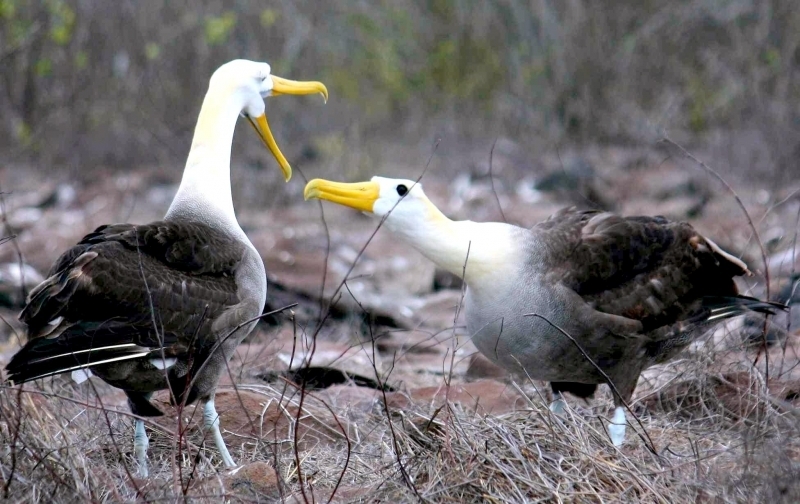 The Waved Albatross breeds in on Española Island in the Galápagos Archipelago. 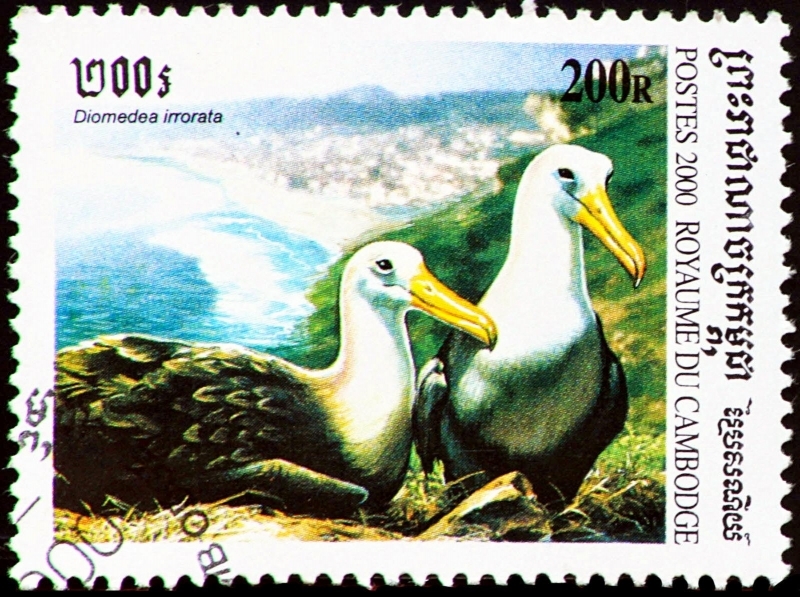 It is possible a small number of Waved Albatrosses also breed on Isla de la Plata, an island that lies off the coast of Manabí province of Ecuador. 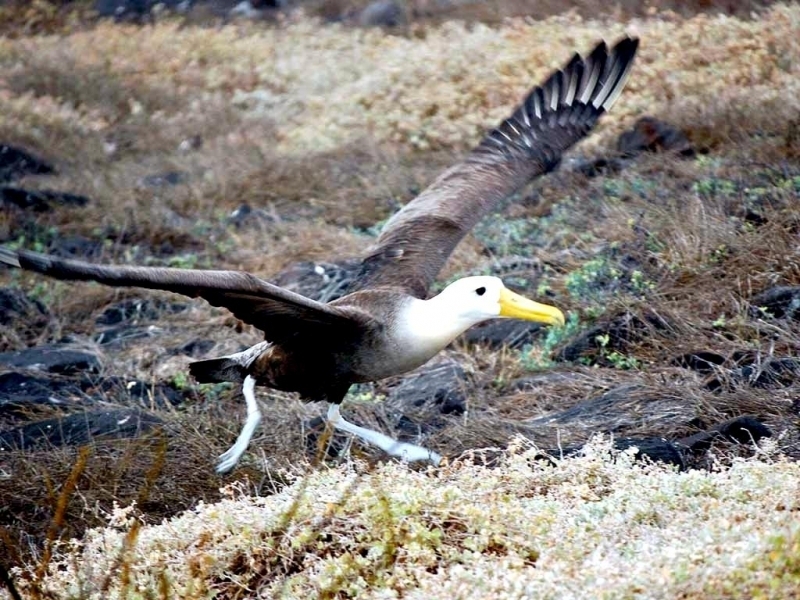 They have also been sighted occasionally on Genovesa Island (an island in the Galápagos Archipelago). 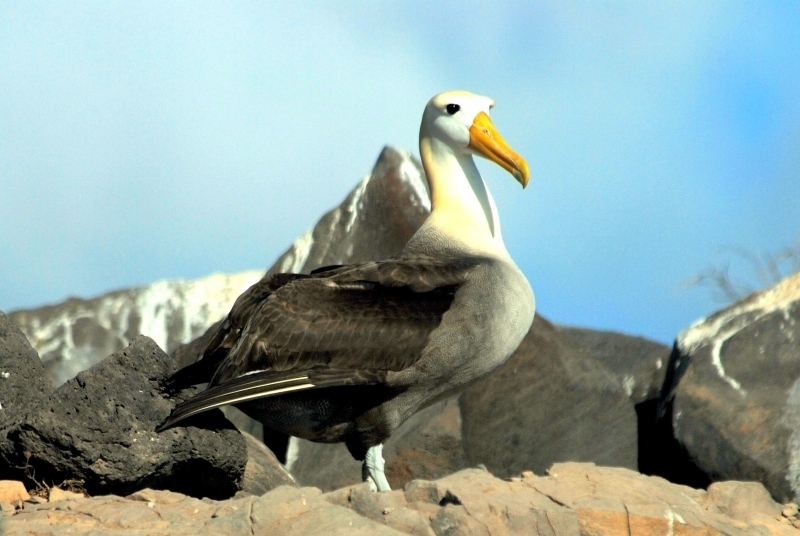 Waved Albatrosses spend most of their lives at sea, but come ashore to breed on the Galápagos Islands. 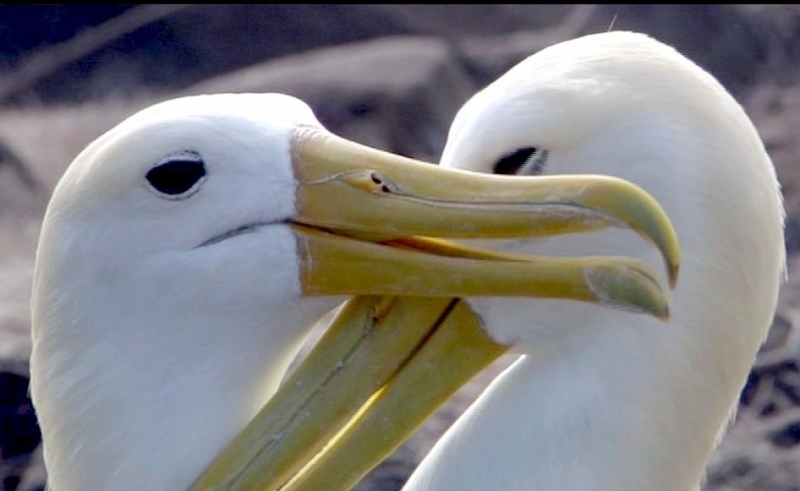 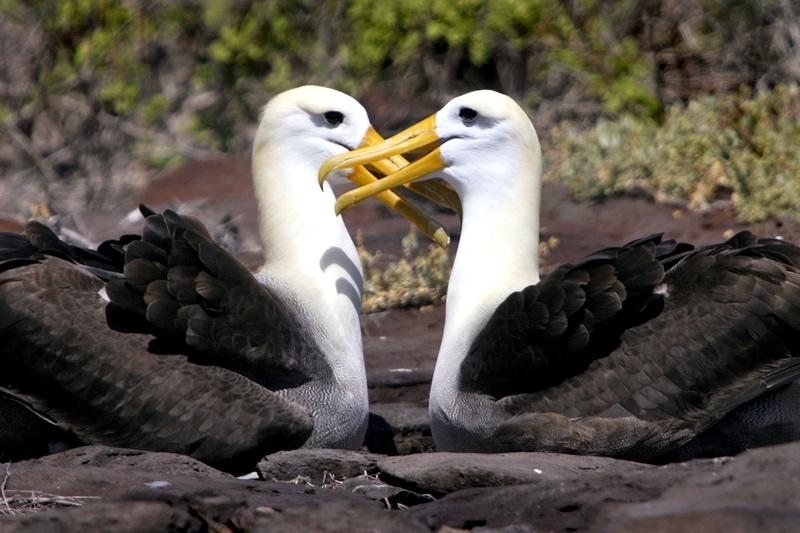 These are the largest birds to be found on the archipelago and they mate for life; a relationship which begins with an elaborate display of circling, bowing. 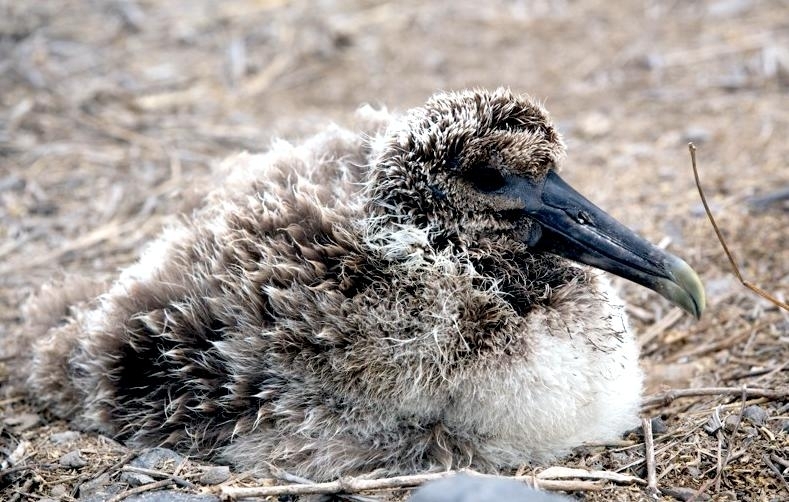 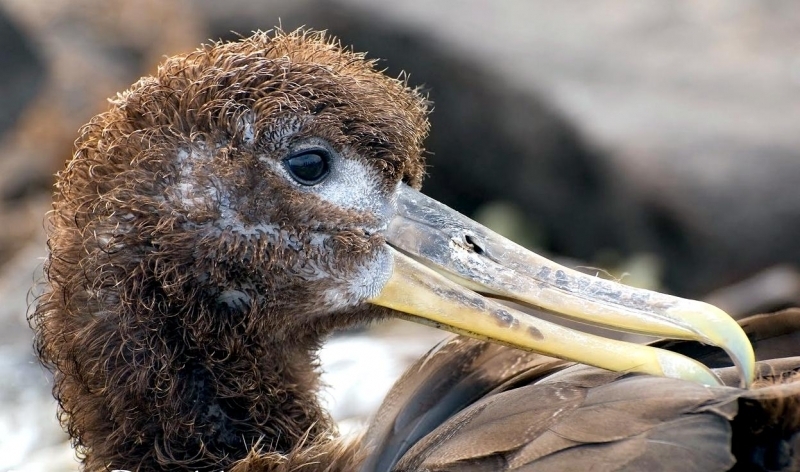 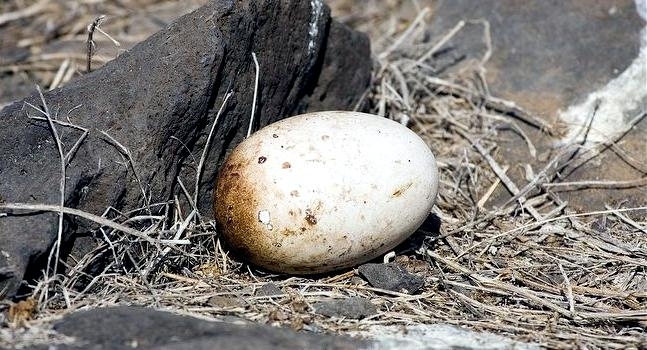 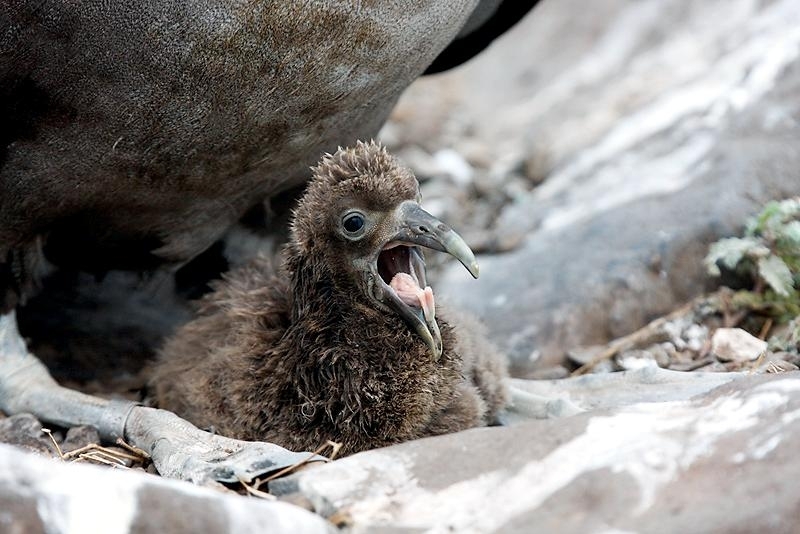 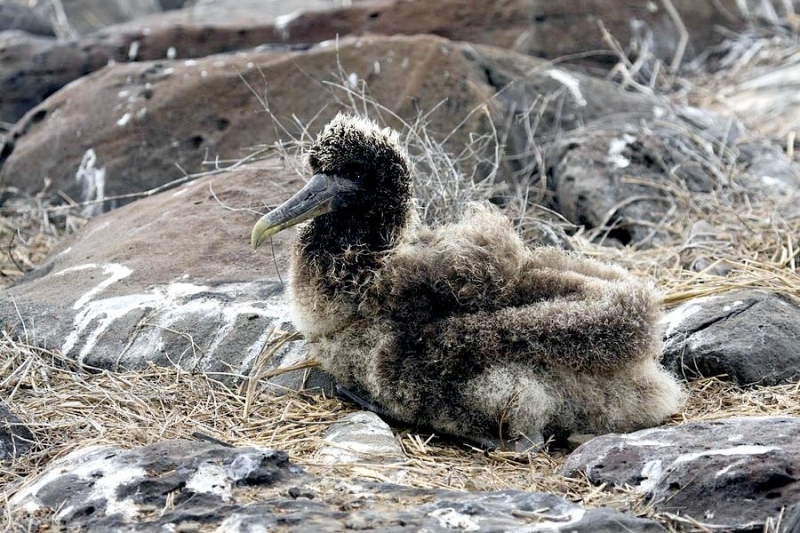 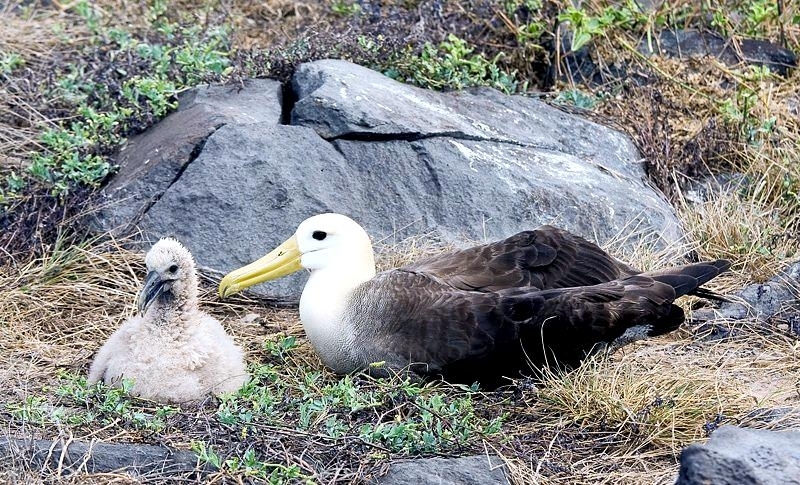 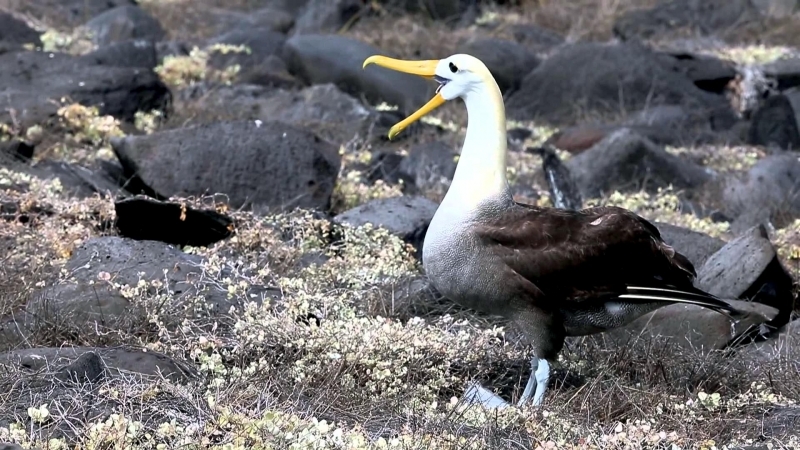 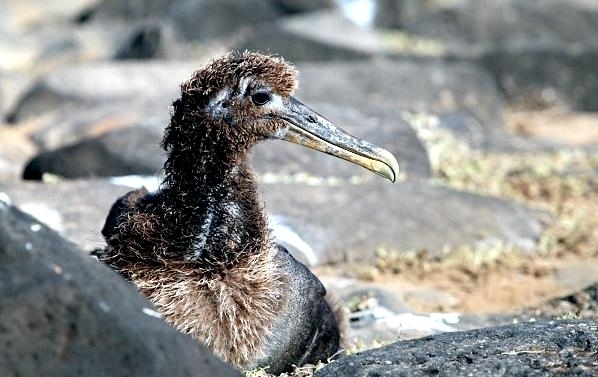 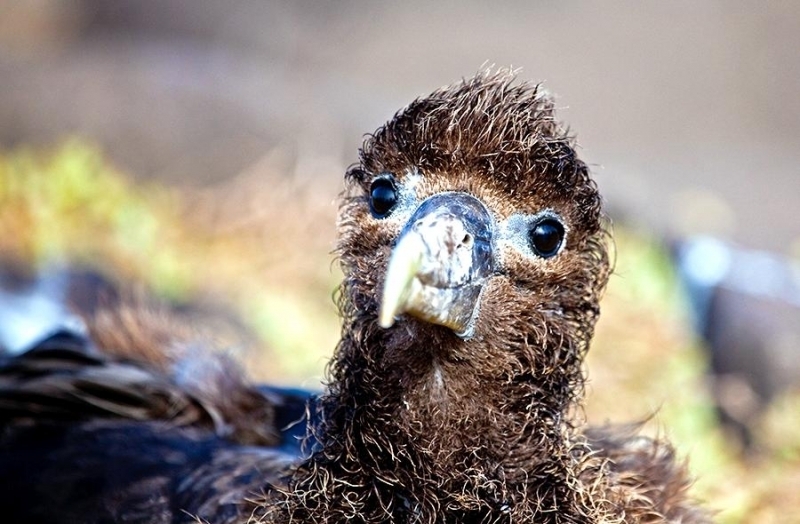 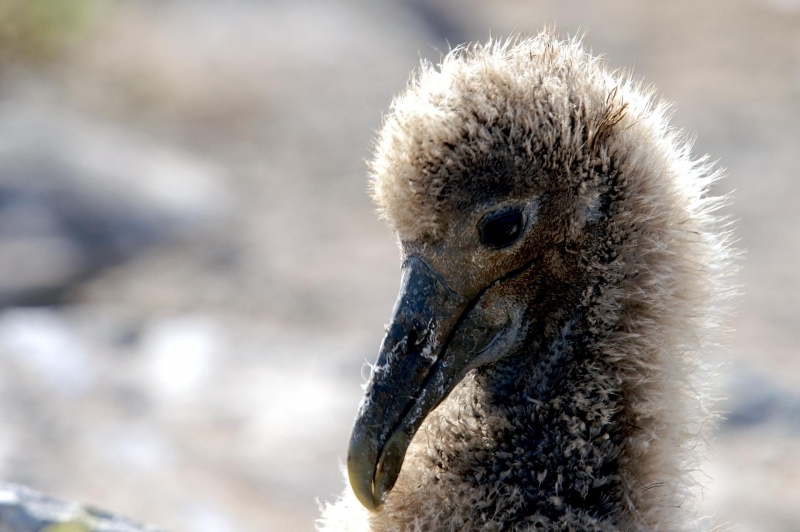 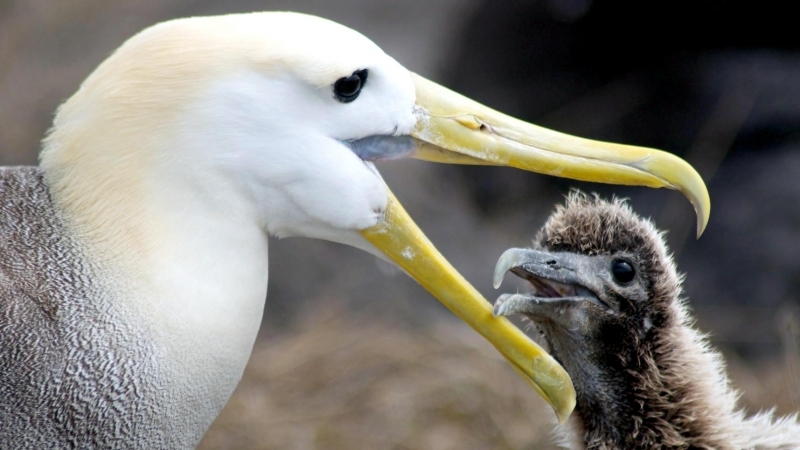 Each year a pair hatch 1 egg and after a mere 167 days, this chick will leave the nest to spend the next 6 years at sea, before it returns as an adult to the islands once more. 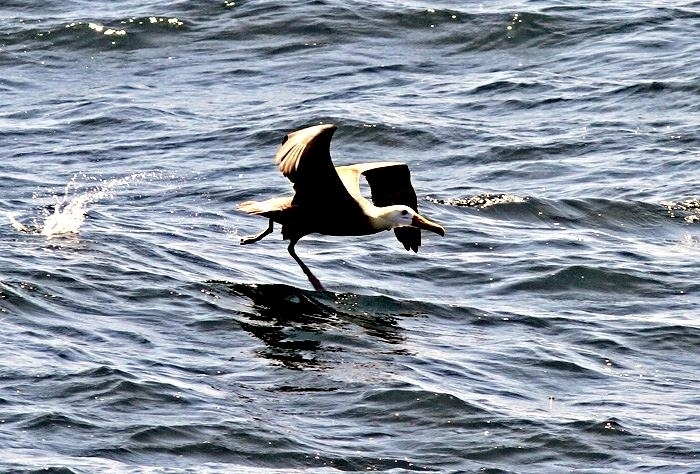 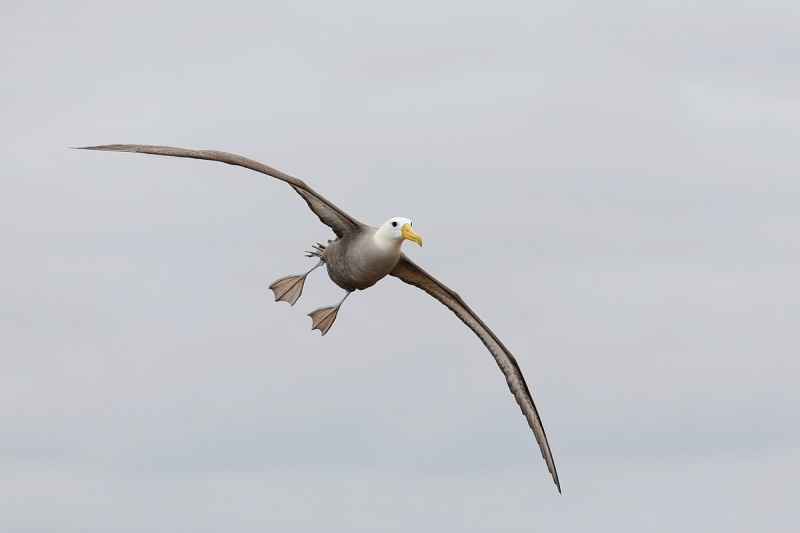 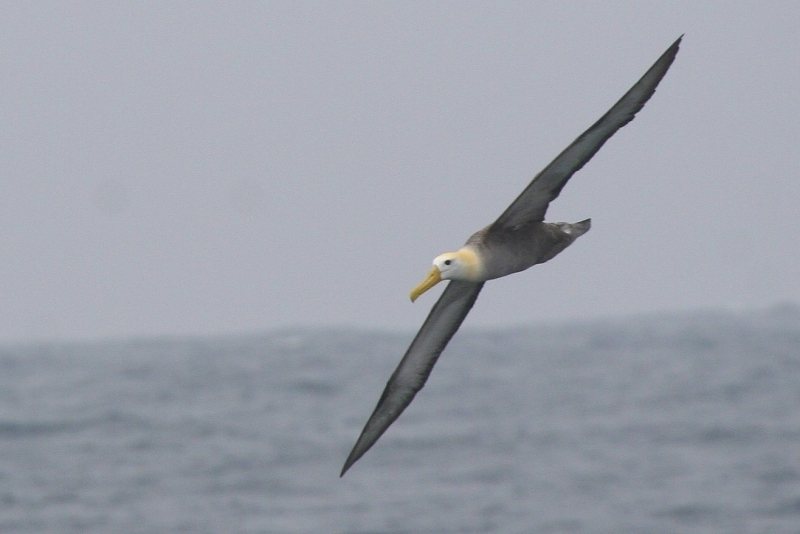 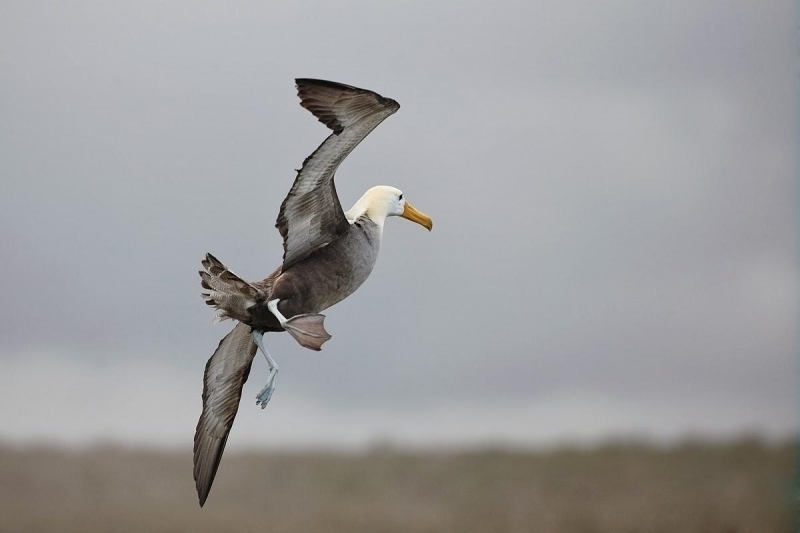 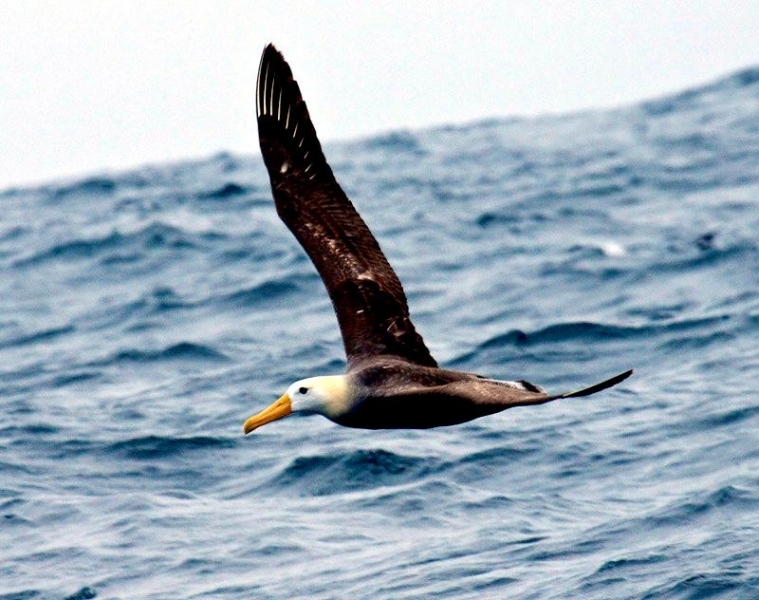 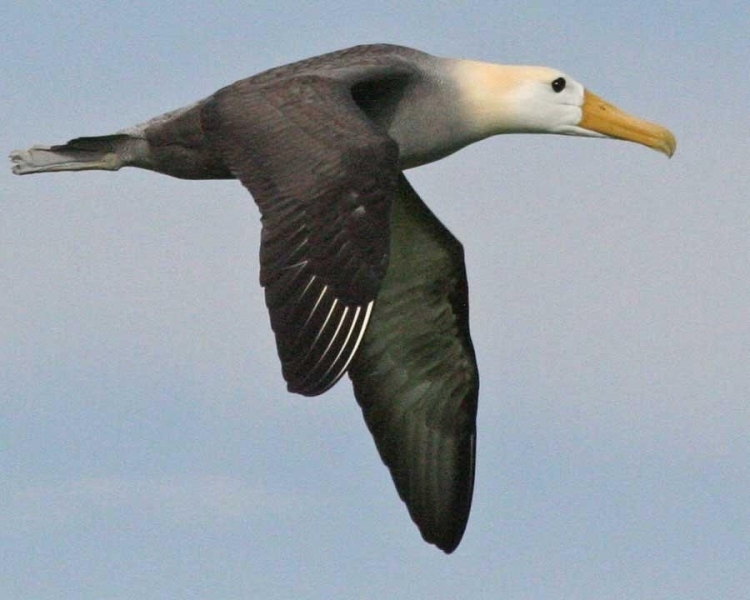 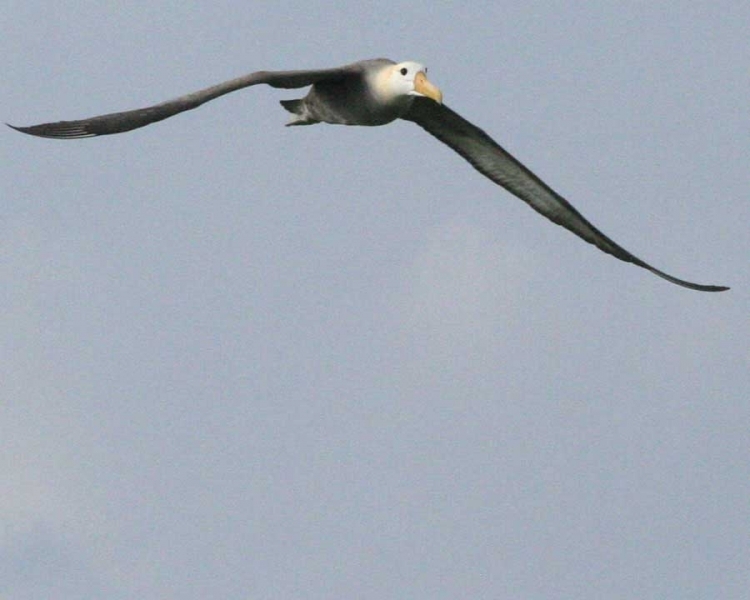 During the non-breeding season, Waved Albatrosses are pelagic seabirds. 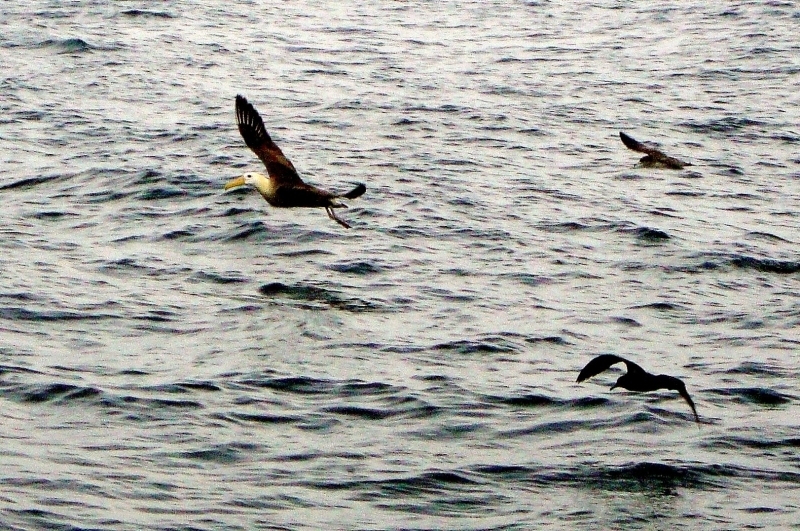 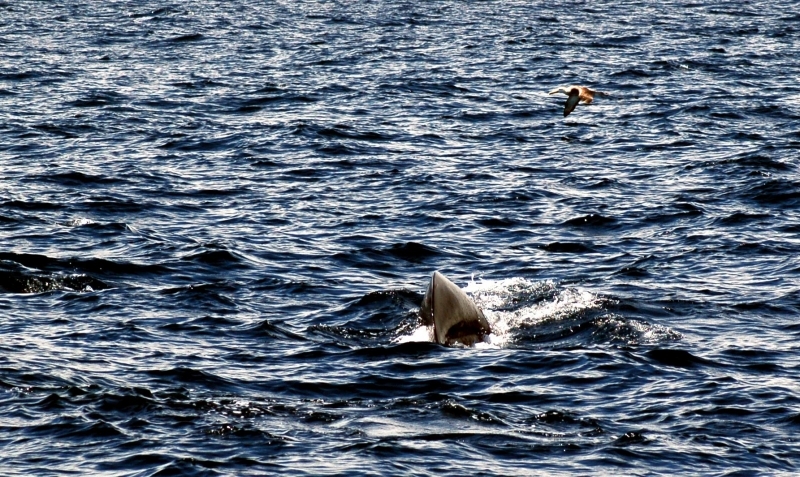 The forage in the waters off the coasts of Peru and Ecuador. 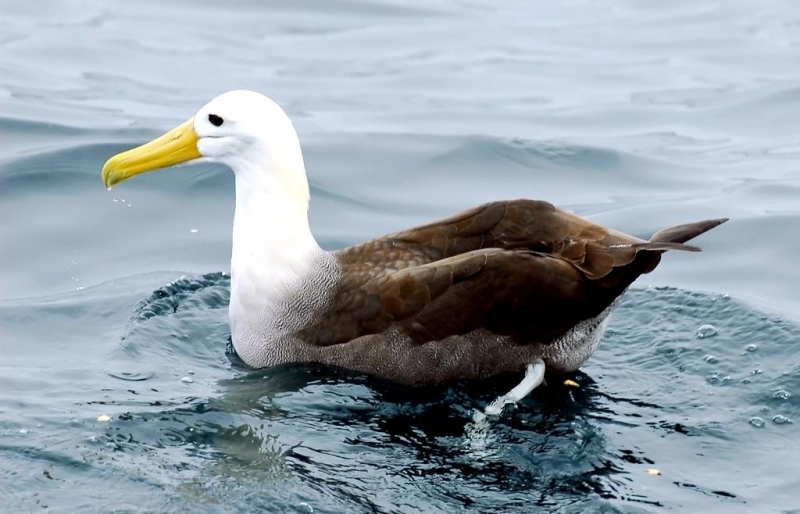 The Waved Albatross is also known as Galápagos Albatross and an average adult is about 7 pounds and 35 inches long with a wingspan about 7 feet. 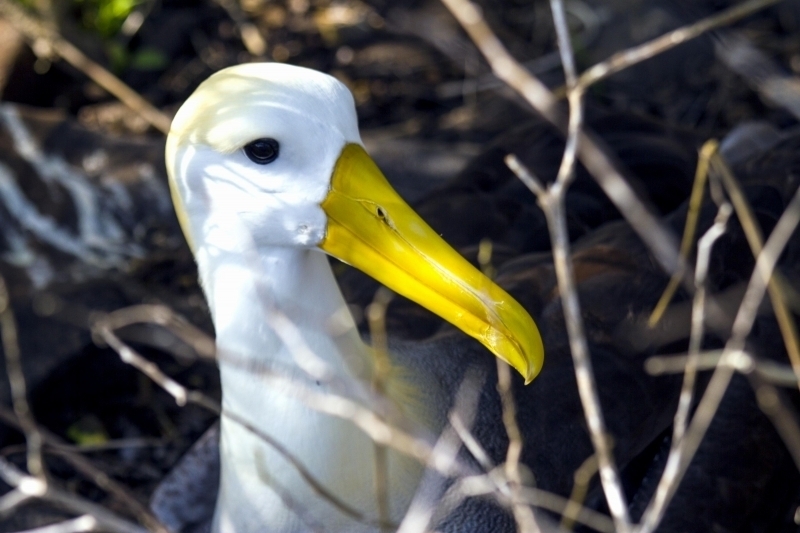 Waved Albatrosses are mid-sized seabird that have a creamy-buff colored neck & head. 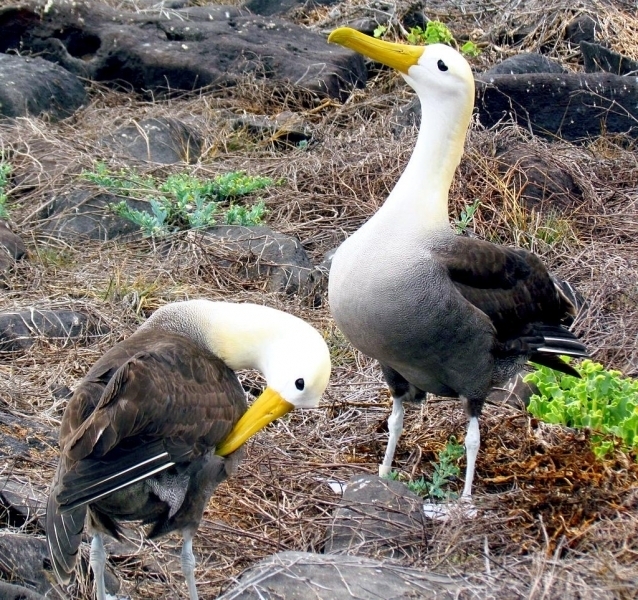 Overall, their body color is brown. 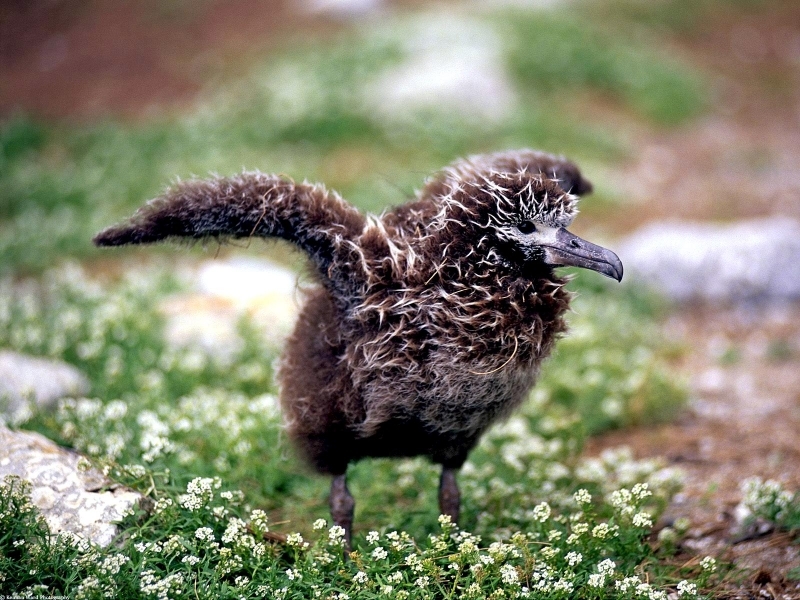 Their upper body (including the wings and tail) is a dark chestnut brown color. 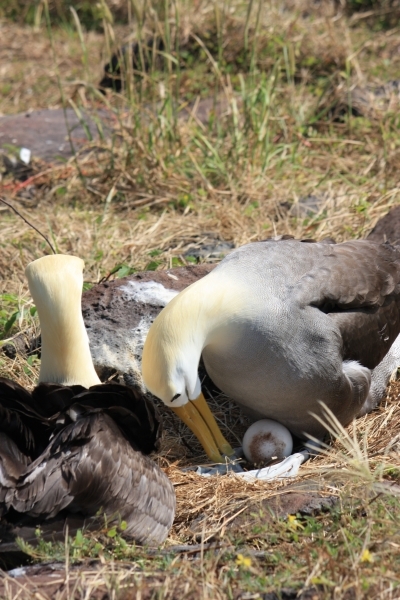 Their belly is a lighter shade of brown. 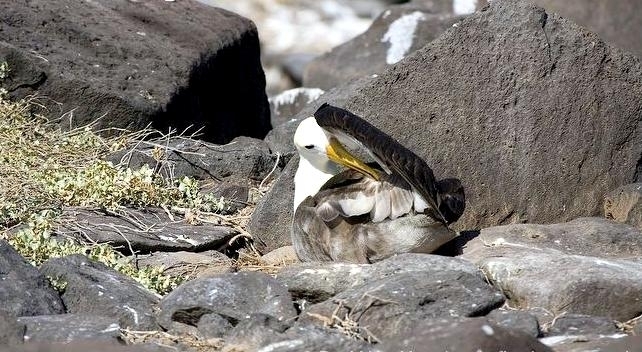 The feathers of their breast are barred, creating a waved pattern (it is this wave-like feather pattern that inspired the name “waved”). 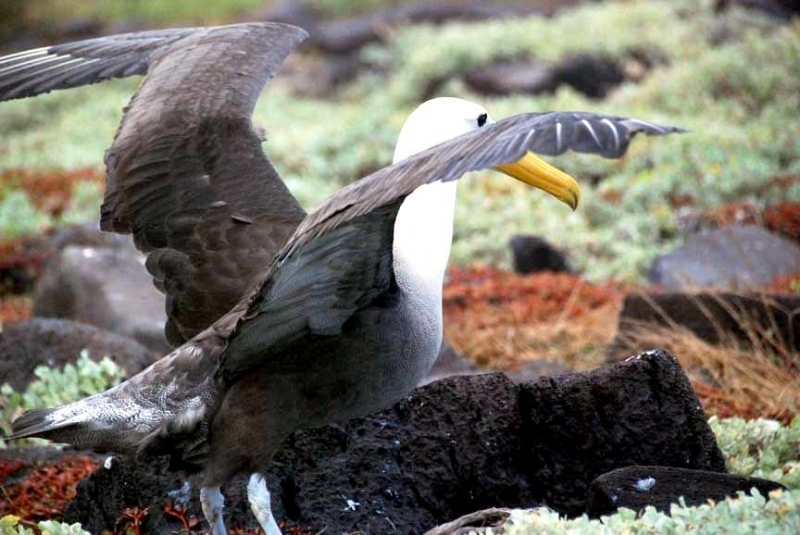 Waved Albatrosses have a small head and a long slender neck, a bill that is long & bright yellow. 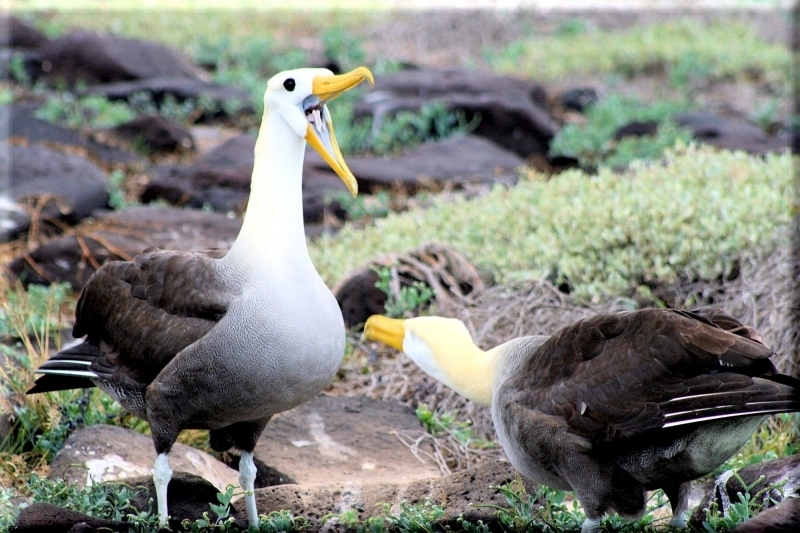 Their legs and feet are a light shade of blue. 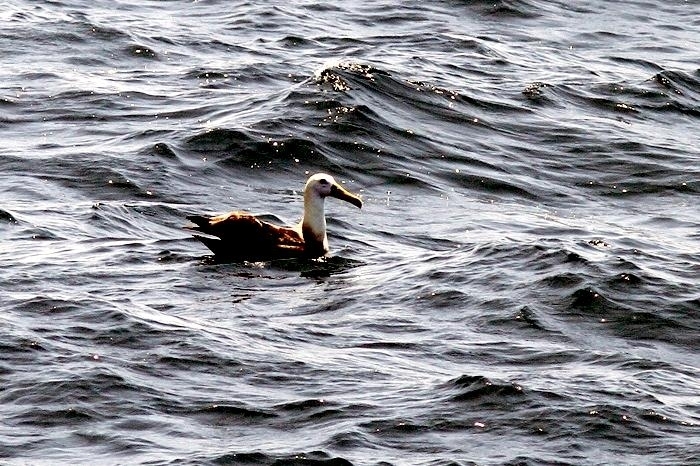 Waved Albatrosses are classified as critically endangered due to their small breeding range and recent population decline. 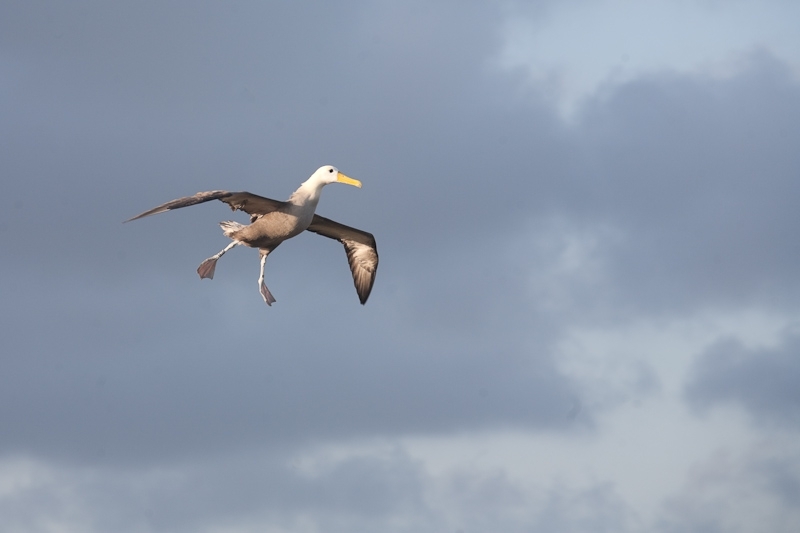 It was recently estimated that the Waved Albatross population includes about 34,700 mature adults. 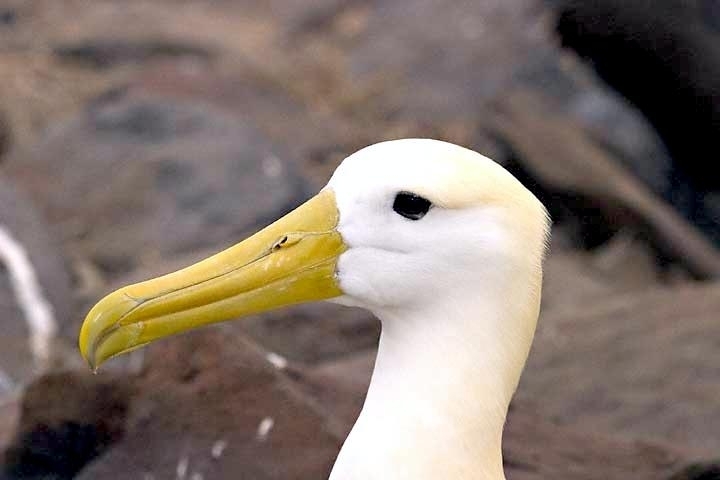 Conservationists studying Waved Albatrosses estimate that the population has declined as much as 19% in the past 84 years. 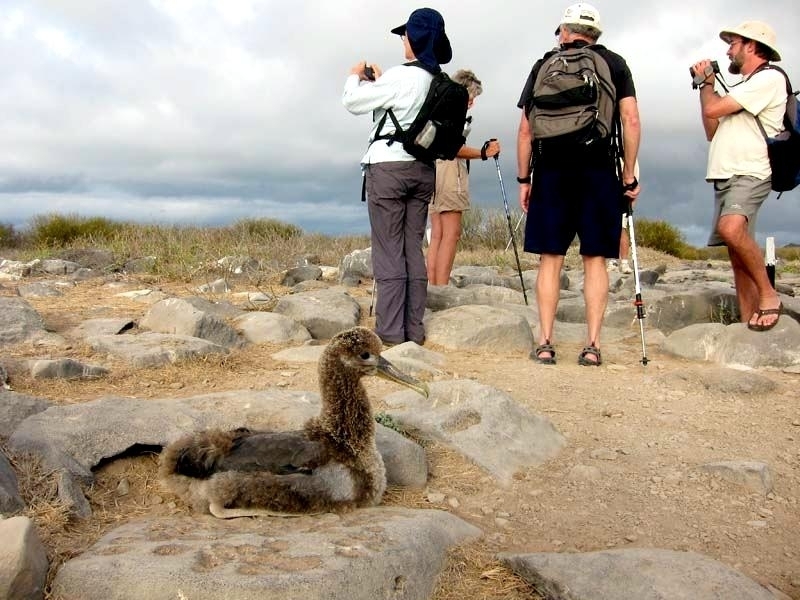 The island of Española lies within the Galápagos National Park and Marine Reserve. 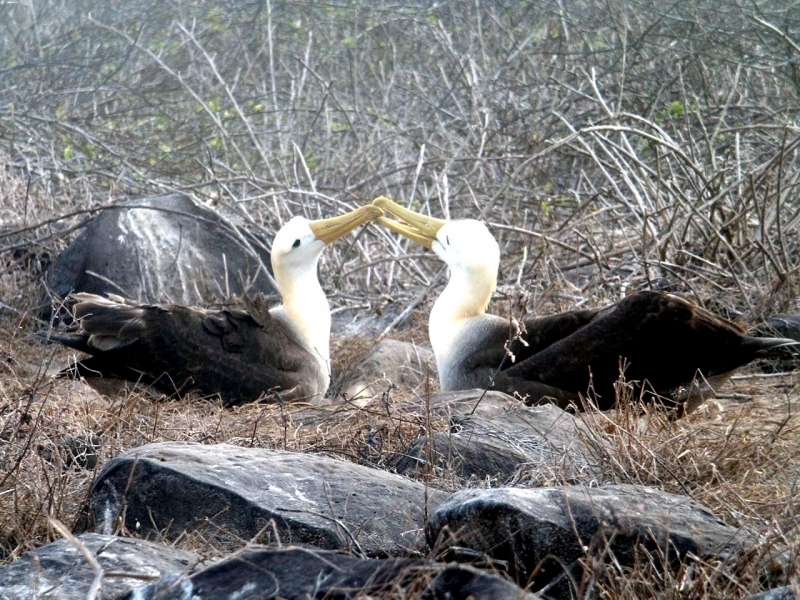 Additionally, the Galápagos Archipelago is classified as a World Heritage Site. 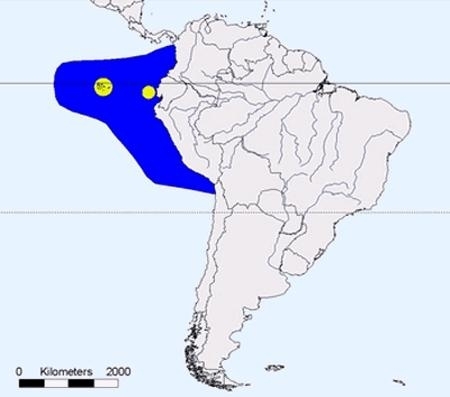 As such, the area receives good protection. 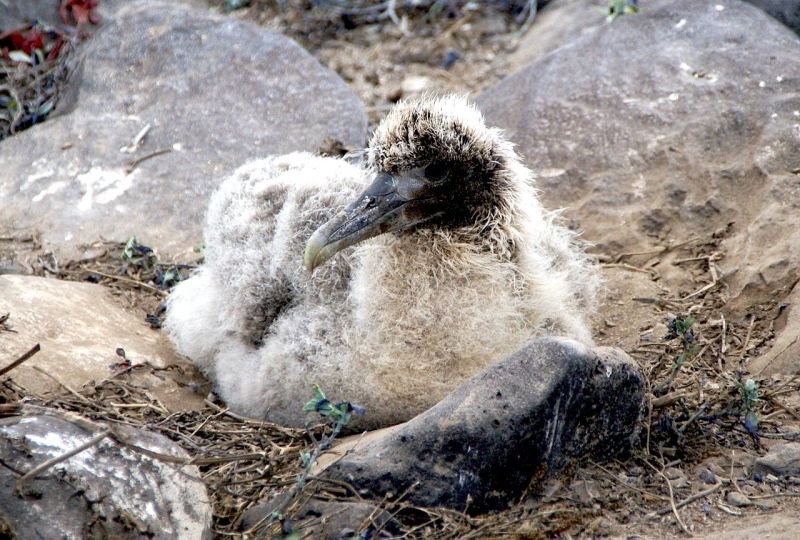 There are no alien species on the island (goats were once introduced to Española where they remained feral until 1978 when they were eradicated). 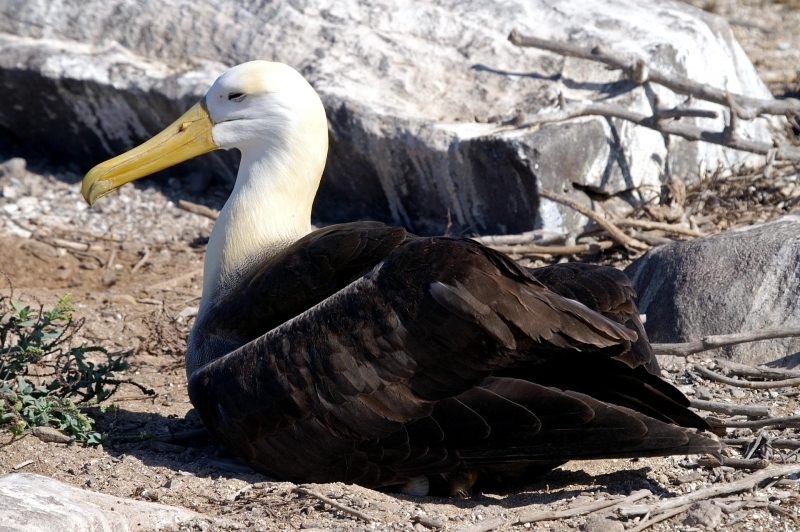 Tourism is limited, so Waved Albatrosses enjoy a relatively safe environment in which to recover. 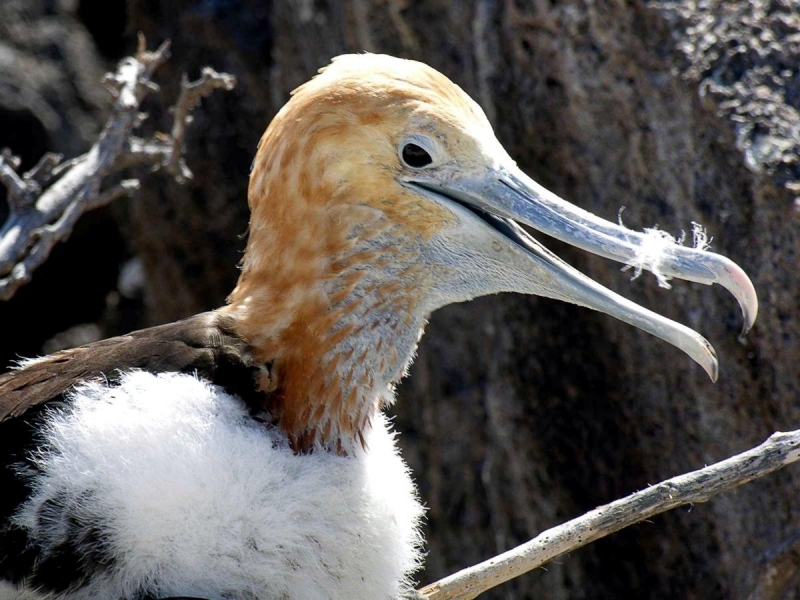 The main threats to their population include illegal hunting (for food and feathers) as well as death due to long-line fishing (the birds are killed by accident when they feed on long-line bait and become hooked on the line). 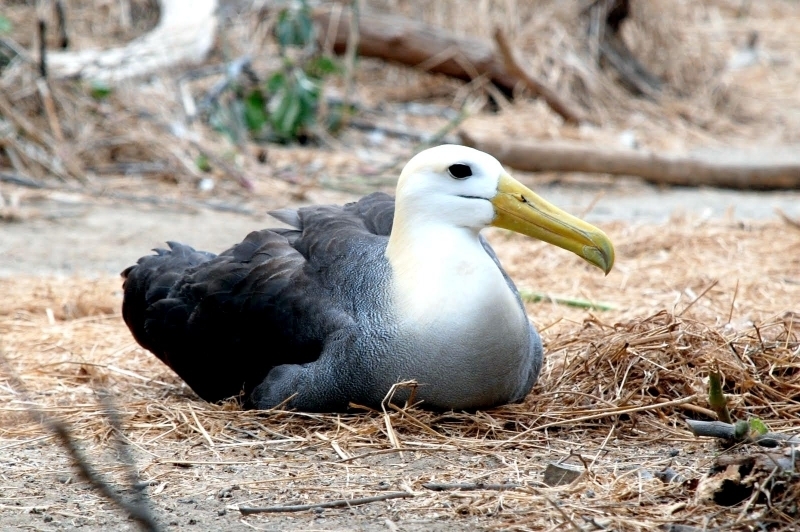 Additionally, Waved Albatrosses appear to be susceptible to the climatic shifts that accompany the El Niño southern oscillation. 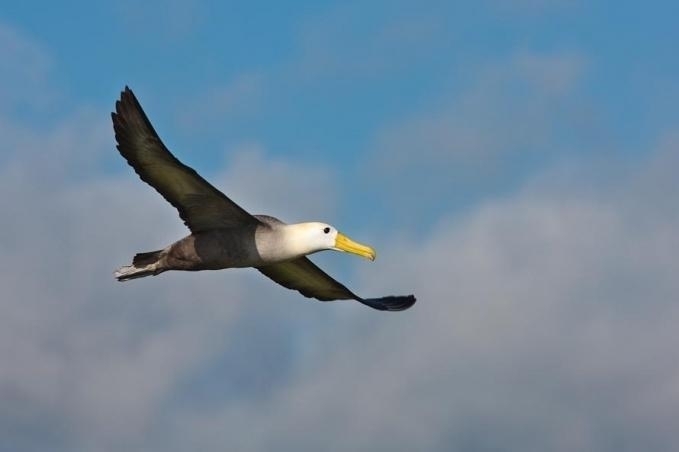 It is thought that the Waved Albatross population rises and falls in response to cycles in their prey populations and that prey populations vary as a result of El Niño southern oscillation shifts. 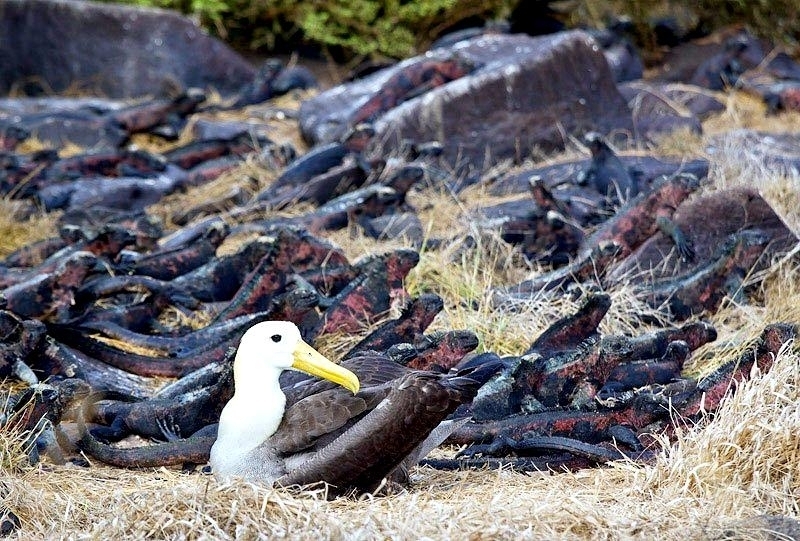 Waved Albatrosses breed in large colonies. 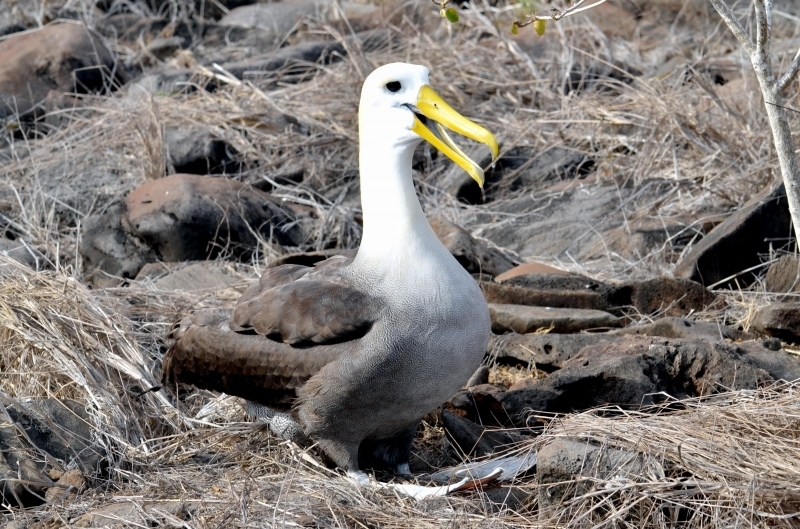 They build their nests on sparsely vegetated grounds among lava rocks & boulders. 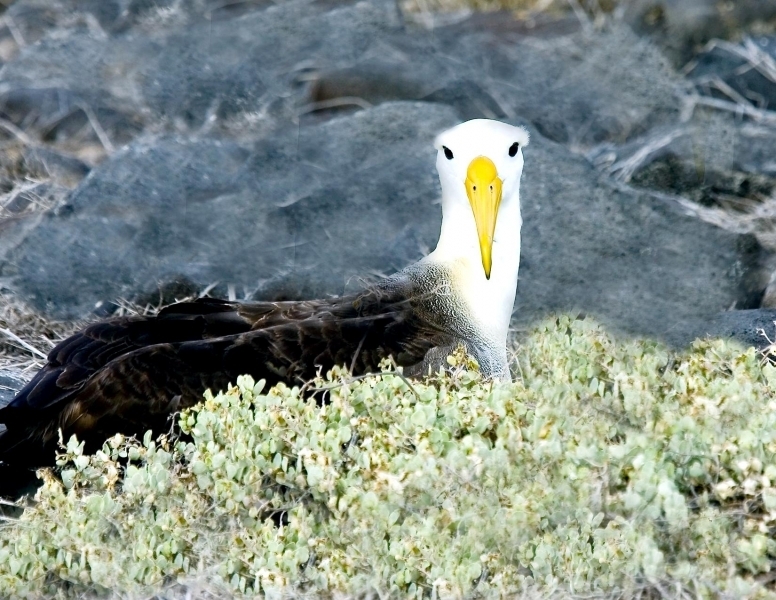 Waved Albatrosses have also been known to build their nests in thick scrub vegetation. 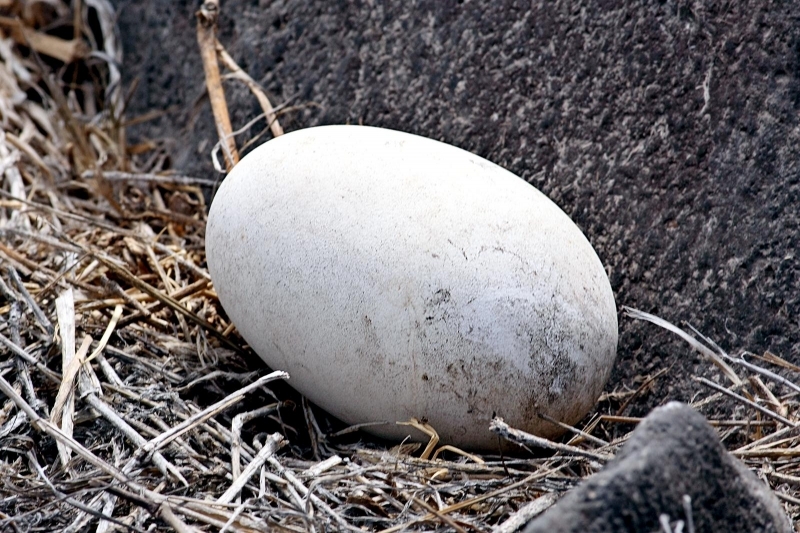 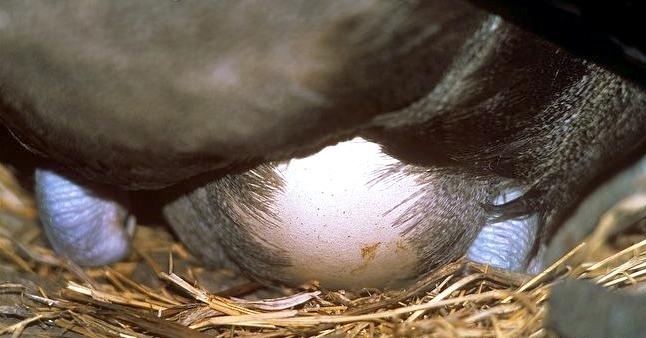 The breeding season begins in late March and females lay 1 egg between mid-April and late June. 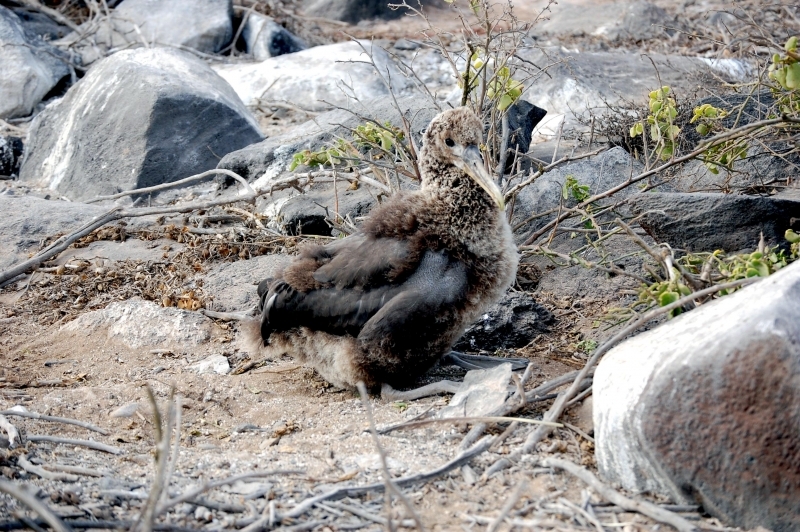 They chick fledges between late December and early January. 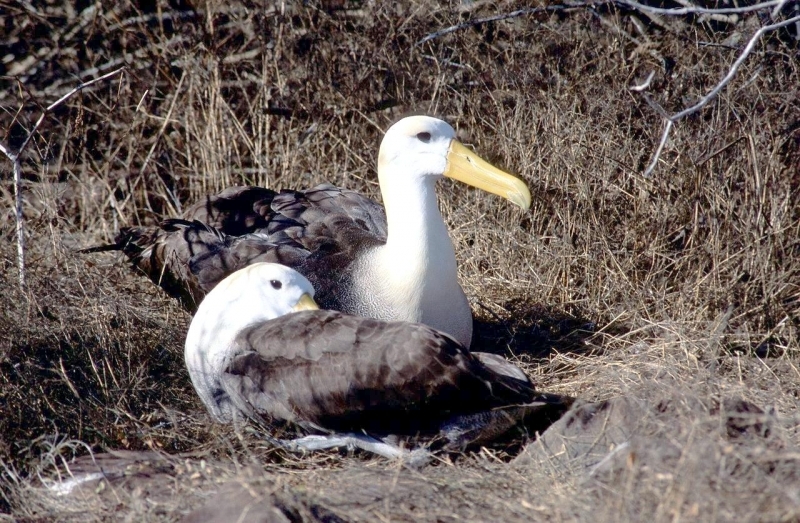 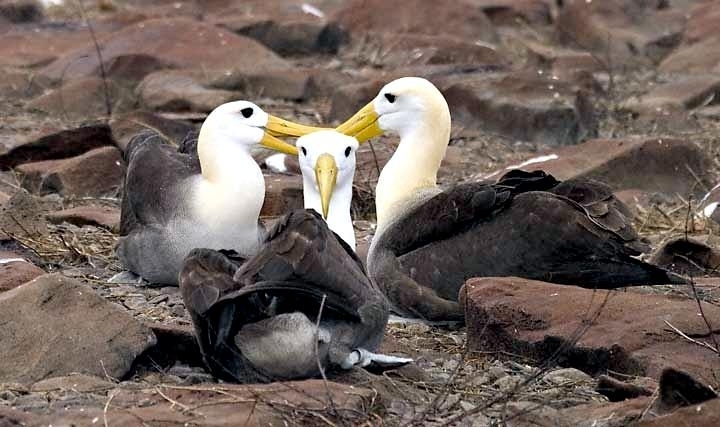 Young Waved Albatross become sexually mature at 4 to 6 years of age and they return to their natal colonies to breed. 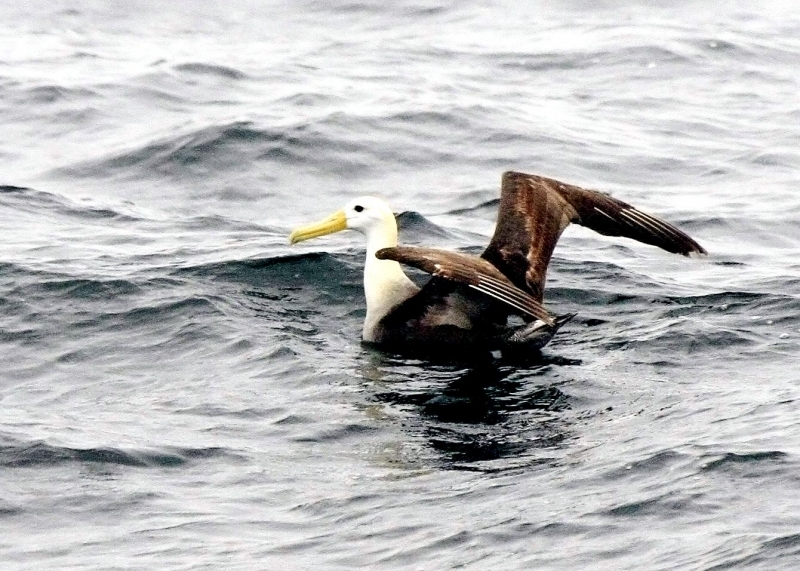 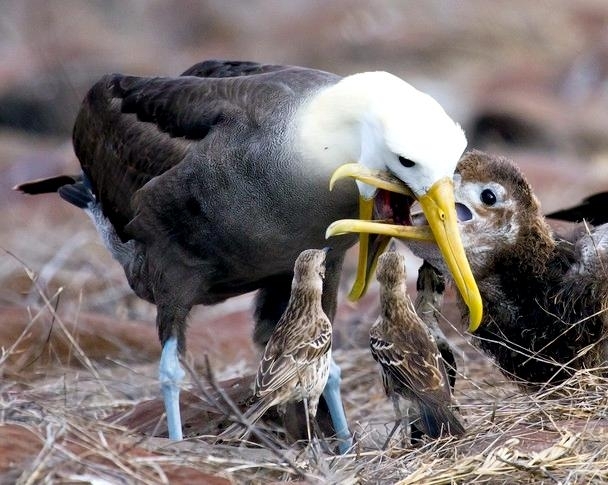 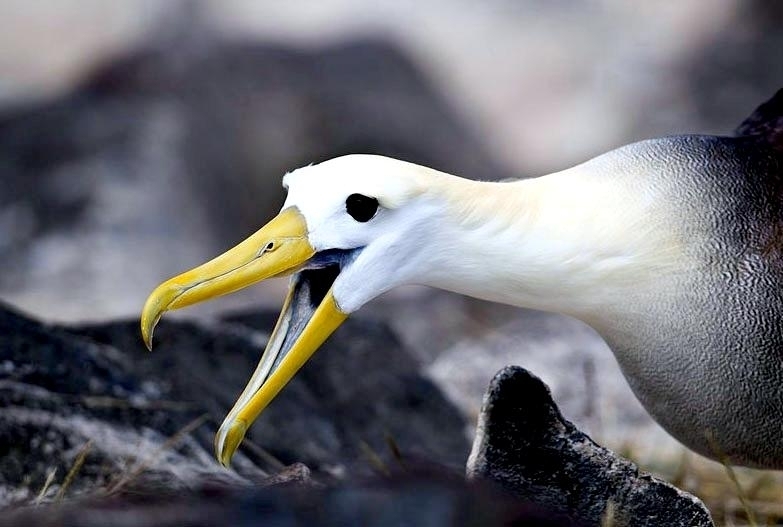 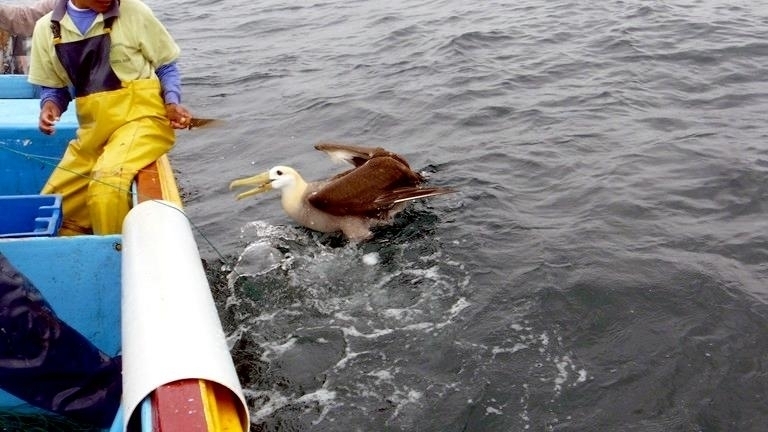 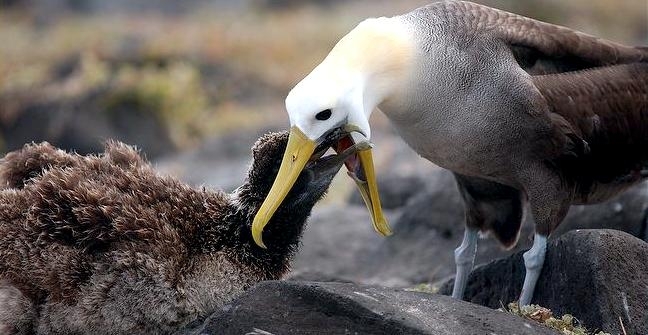 Waved Albatrosses eat fish & marine invertebrates such as crustaceans and squid. 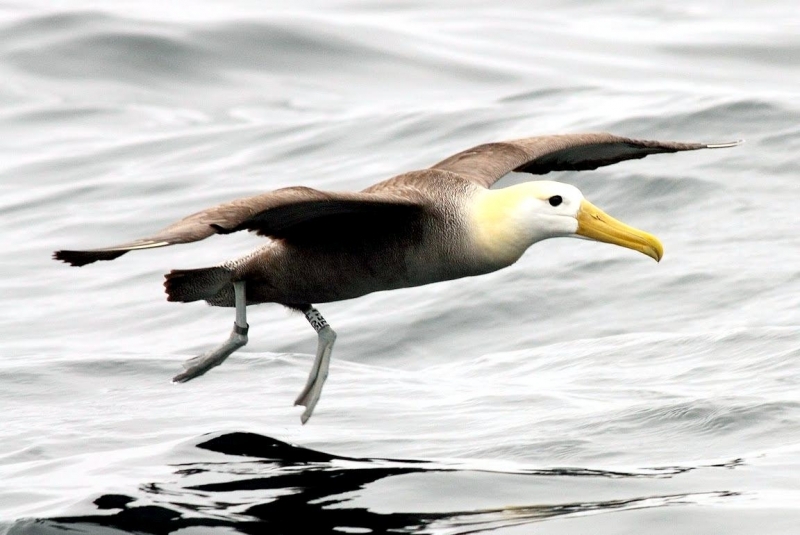 Waved Albatrosses are pelagic seabirds that inhabit the tropical waters of Peru and Ecuador. 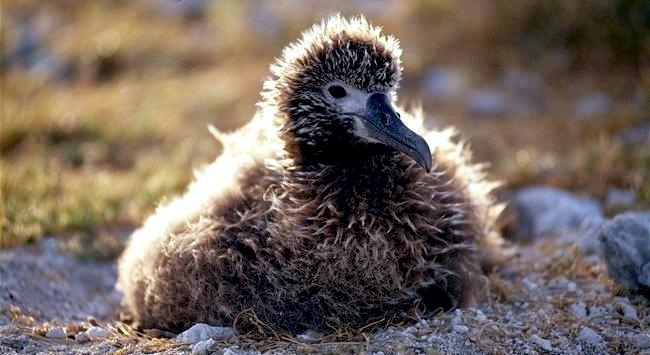 They breed on the oceanic islands such as the Galápagos Archipelago and Española Island. 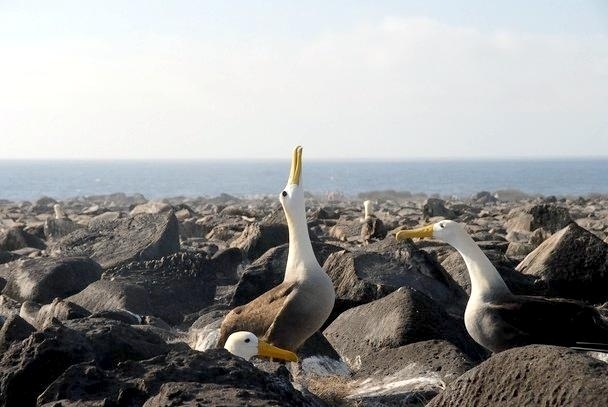 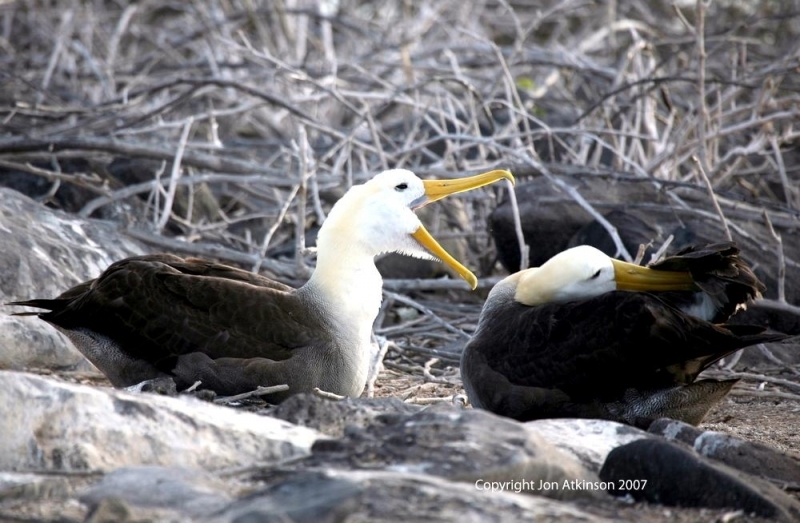 Nesting sites are constructed on exposed rocky coast such as the lava rocks of the Galápagos.